Children love tents, teepees and forts. Enclosed spaces give them a feeling of safety and adventure and at the same time offer a space of endless imagination. 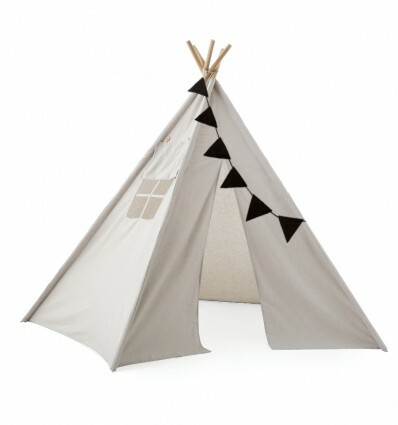 Most tents seem to be barely big enough for one or two small children, and certainly mum or dad can never fit inside. So we have made ours slightly bigger, to fit friends, parents and plenty of plushies. It's also easy to assemble and looks attractive in your living room, kid's room or play room. The ooh noo Play Tent is a must-have in your garden or backyard or even on your terrace. You can also take it with you to the park or beach and use it as a stylish sun shelter for the whole family. The side window makes a great peek-a-boo game and also helps keep the tent cool. When not in use, you can also easily fold up the Play Tent and store it for your next play date. Assembled & Open: Height - 155 cm. The Play Tent has a 5-sided base: each side edge is 115 cm, to create a combined width at its widest (diagonal) of 186 cm. The measurement from the centre of a straight edge to the corner (apex) directly opposite is 177 cm. First, remove the wooden support sticks from the Play Tent. Next, machine wash the fabric at 30° C on a moderate spin cycle and then hang to dry. Our round Little Village Baby Play Mat (120 cm diameter) makes a great addition and fits inside the tent to add to your play time fun. WARNINGS: Not suitable for children under 36 months. Long cord. Strangulation hazard. Aperture. Entrapment hazard. Do not leave children under 36 months playing unattended. Toy is intended to be assembled by an adult. The proper assembly shall be checked by an adult before use.